According to the World Health Organization, 50 to 75% of people have had a headache in the last year. Not only are headaches common, an inconvenience, and uncomfortable, but they also can be debilitating. Headaches can cause you to change your lifestyle, diminish production, performance, and mood; and escalate irritability, stress, and reduce your normal daily activity. Headaches can happen for many reasons which can make difficult to know what type of headache you have and the cause. Headaches are a painful and disabling feature of a small number of primary headache disorders. Primary headache disorders are namely migraine, tension-type/cervicogenic headaches, and cluster headaches. Because we, at Motion ChiroTherapy, treat musculoskeletal disorders, the information below is most pertinent to headaches that are related to the spine, namely cervicogenic headaches. Cervicegenic headaches are associated with neck problems. Posture plays a critical role in regards to neck pain. It can cause pain in the head region which in turn can trigger a headache. The typical American lifestyle in the 21st century puts excessive stress on our joints. Technology, desk jobs, and sleeping habits — to name a few — influence headaches. The muscles, tendons, and ligaments of our neck are pain sensitive and can send symptoms to other areas of the body. Cervicogenic headaches are rarely a sign of something scary or dangerous. However, it’s important to distinguish the difference from other types of headache as they can share similar symptoms. As migraine sufferers know, a migraine is different from a “bad” headache. Migraine headaches are typically more severe than cervicogenic headaches and have a known trigger, e.g., food, light, smells. Pain is usually on one side of the head with symptoms behind the eye and at the back of the head. Sensitivity to light and noise, and nausea and vomiting are common. Some experience “auras” or visual disturbances preceding a migraine. Migraines can last a few hours to as long as a few days and can occur seldom or several times a year. Cluster headaches are the least common type, and their underlying cause is unknown. Cluster headaches are very intense — it is often described as one of the worst pains you can experience. Cluster headaches occur regularly over a period in “clusters.” They can last anywhere from 30 minutes to a few hours, occurring multiple times in a day over several weeks. If a headache occurs suddenly and accompanied by pain, dizziness, nausea, vomiting, or unconsciousness — especially when associated with trauma — seek emergency medical care immediately. Poor postural and movement habits cause mechanical imbalance. In order to compensate, muscles tighten in an attempt to reestablish alignment. Subsequently, nerves to the head become irritated by the tight muscles they traverse. 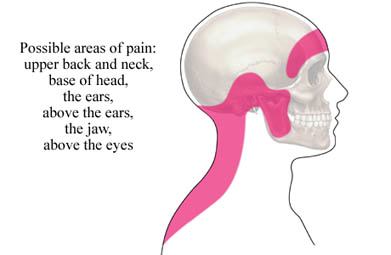 The most common cause of a cervicogenic headache is the accumulation of poor body mechanics and postural habits. These headaches can occur from sudden movements or over time for no apparent reason. Pain from turning or bending your head/neck is not because it is inherently bad, rather it is the result of the accumulated stress of poor postural and movement habits. We’re not meant to sit in chairs and stare at electronic screens for hours on end. Our bodies like to move — it’s healthy for our muscles and joints. From infancy through the first year of life, we learn to how to move properly, setting us up for the rest of our lives. But if movements or postures of any joint are not balanced, it can create and make problems worse. The idea of balance is important to keep in mind. Picture yourself starting your day: bending forward over the sink to brush your teeth, bending forward to get dressed, bending forward to look at our cell phone, bending forward to stare at the computer screen on your office desk — you get the point! The reoccurring pattern of habitual postures and movements can lead to joint imbalance and subsequent tight muscles and irritated nerves. Rarely are cervicogenic headaches a serious or structural problem, rather an imbalance of positions, postures, and movements. The accumulative postural stress of sitting as a daily habit is like bending your finger backward. It may not hurt at first, but the longer you hold it there, and the more pressure you apply over time, it will start to feel uncomfortable and aching. When you let go of the finger, you’ll have a residual ache, but you’ll notice the pain quickly subsides. This experience describes mechanical pain and is similar to the typical cervicogenic headache experience. While most acute bouts of cervicogenic headaches resolve on their own within a few weeks, the risk of recurrence is very high. It’s important to minimize variables and finally understand your headaches. If the headache is 50% driven by a mechanical influence, e.g. positions and movements, then that is great information. At Motion ChiroTherapy, we will teach you a specific movement that will become your first line of defense to battle your headaches. You will learn warning signs that a mechanical headache may be coming. Our goal is to teach you how to prevent your headache all together! Few individuals need surgery for cervicogenic headaches. However, if the pain is debilitating and unrelenting after conservative options are exhausted, a “nerve block” or surgery may be necessary. At Motion ChiroTherapy, we successfully treat headaches. Our goal is for you to understand your headache better and create a path to sustainable relief. Sit with upright posture with lumbar support. Sleep with one pillow supporting a neutral, aligned spine. STILL STRUGGLING WITH A HEADACHE? WE CAN HELP! At Motion ChiroTherapy we initiate treatment for headaches by utilizing the McKenzie Method (MDT). MDT is a proven system of examination, treatment, and classification of spinal, joint, and other musculoskeletal pain, backed by years of research, evidence, and practice. We then use hands-on care to speed this process up, releasing tight muscles and joints to get you back in motion ASAP. If your problem is something we are unable to treat, our assessment will tell us this within the first few visits, and then we recommend the next best course of action to find you a solution. Valrico, FishHawk, Bloomingdale and Riverview headache sufferers: you don’t need to spend another day waiting for relief from pain! Call Motion ChiroTherapy to schedule a neuromuscular examination for your headaches. Dr. Robert Lutz is also the only chiropractor in Valrico, FishHawk, Bloomindale and Riverview certified in Dynamic Neuromuscular Stabilization (DNS), which he uses to strengthen the neck and core. He also uses Active Release Technique (ART) and other soft tissue therapies like FAKTR & the TheraGun. There are many different approaches to select from and he will find the right tool to get the answers and relief you deserve.